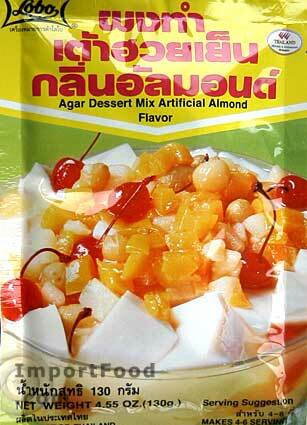 This quick and easy mix makes delicious Thai agar dessert. Agar dessert is easy to work with, and is delicious with fruit salad. Typically this is a summertime treat but you might enjoy it with fruit salads. We also highly recommend this almond flavor agar dessert with Thai iced tea, something that restaurants in Thailand are known to do. Just make the agar, cut it into cubes, and add it to your Thai iced tea. Served together in the same glass, this is a heavenly combination. To prepare, just empty contents of this packet in 3 cups water, bring to a boil while stirring. Pour into a mold or shallow container (such as a cake pan, shown below) and cool until set. Cut the cream into bite-sized cubes, or use your holiday cookie molds. Place in a serving bowl with fruit salad and gently combine. Ingredients: sugar, non-dairy creamer, agar agar, whey powder, tricalcium phosphate (anti-caking agent), artificial flavor. Product of Thailand.